To help us reach our goal of 500 members so that we can become officially registered as a political party, click here. My name is Ben Uffindell, and for those of you who read the Marlborough Express, the above paragraph means “hello” in Maori. I am the editor of The Civilian, one of New Zealand’s most esteemed and longest-running newspapers, as well the country’s pre-eminent online newspaper. Here at The Civilian, we take great pride in what we do, because we know no better. For three months now, The Civilian has faithfully covered the news that matters to New Zealanders, as well as a substantial amount of the news that doesn’t. We have also opened a PO Box, and this made us feel pretty good about ourselves. In our short and humble tenure as the best news organisation in the world, we’ve seen a fair number of significant events unfold on our watch. We’ve seen stories of happiness and joy, and stories of sadness and pain. We’ve also seen a video of a man getting sucked into a jet engine. We didn’t like it very much. But of all the events we’ve had the privilege of covering, none has saddened us quite so much as the one that transpired last week, when we were devastated to learn that beloved Revenue Minister Peter Dunne’s United Future party had been deregistered by the Electoral Commission on a petty technicality; that being that Mr. Dunne could not demonstrate with any credibility to anyone that his party had 500 members. Our heart broke at word of this news, and we couldn’t help but feel that it was all a bit unfair. Indeed, 500 members is a lot. To have that many enlisted, you’d have to register just under 0.01% of the country’s population. This is hard enough for a group of people, let alone Mr. Dunne, who is only one person, and we can’t imagine he has 500 friends by any stretch of the definition. Seriously, who has 500 friends? I don’t. Understandably, this made Peter Dunne sad, which, in turn, made us sad. If there’s one thing we hate to see, it’s a wet bow tie. So today, in the great New Zealand tradition of solidarity and mucking in, we’ve decided to help Peter out. Pun absolutely intended. 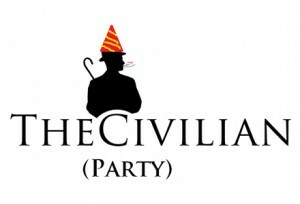 Today, on this, the Friday the 7th of the June, The Civilian is proud to announce that we will be registering an official political party, to be called The Civilian Party. We’re not doing this to spite Peter Dunne. On the contrary, we’re doing it to help him. We want to give him some encouragement, and let him know that getting 500 members to form a political party isn’t actually that hard when you really put your mind to it. If we can show him that we can do it, then surely he can too. But we’re not just doing this for Peter. We’re doing this because we believe that you deserve a voice. Just a small one; nothing too loud, or you’ll get annoying. But enough that you can help make the negative change we need in this country. For too long now have our nation’s newspapers sat idly by and not become political parties, wielding their journalistic influence as an institutional weapon against their opponents. How is it that we allow this not to happen? And why hasn’t it happened? National could really do with a coalition partner next year, and the New Zealand Herald seems like a perfect fit. Or what about Scoop.co.nz? We’ve always needed a party to the left of Mana. Indeed, it is nothing short of inexplicable that our media hasn’t openly prostituted itself for political gain. Well no longer. The Civilian was the first newspaper to be printed online. It was the first newspaper to reveal the winner of X Factor. It was the first newspaper to get a journalist to call John Boscawen. And with your help, we’ll become the first newspaper to become a political party. Over the coming days and weeks, we’ll be registering party members, designing a (better) party logo, writing official party rules, and finally submitting our application to the Electoral Commission. Four hundred years ago, when our ancestors first came to these shores from America, they saw ahead of them a better and more prosperous life in New Zealand. They didn’t see the dark clouds of uncertainty and despondency that we see today. They saw light, and a crystal clear horizon glowing on the fruitful landscape that lay before them. It is that spirit of optimism and ruthless colonialism that The Civilian Party will bring back to this godforsaken country. So if you’re ready to join us on this mythical journey, click here to learn how you can become a member of The Civilian Party and help us to reach the 500 members we need to become officially registered by the New Zealand Electoral Commission. Ka nui tēnā māku. Kua ora au. Let’s get some things change’d.